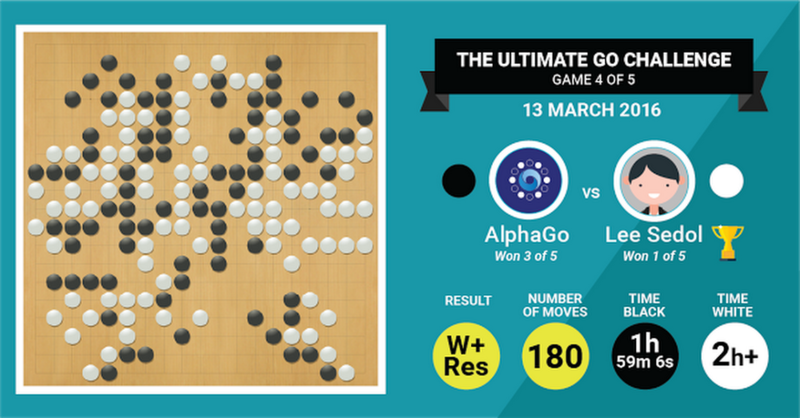 After a loss in Game 4, and a move early on that looked like a mistake, but could have been a creative and effective new move, AlphaGo won Game 5 against the legendary Lee Sedol. This final game of the match was close until the very end, with commentators going back-and-forth about who was on top. But after 280 moves, Lee resigned, having gone through two byō-yomi overtime periods. 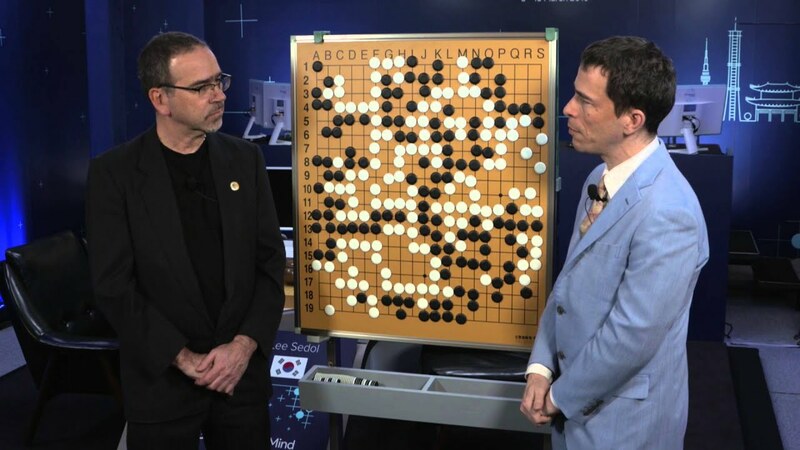 This concludes the 5 game match between AlphaGo and Lee Sedol, with AlphaGo winning the match 4 games to 1 against the best Go player of the last decade, achieving a major milestone for artificial intelligence a decade earlier than many predicted. 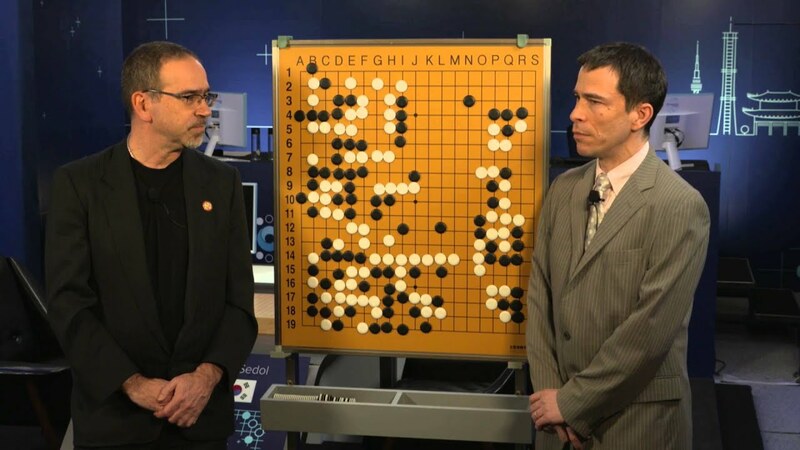 With AlphaGo’s victory, Google DeepMind will donate the UDS$1 million in prize money to UNICEF, STEM (science, technology, engineering, and math) charities, and Go organizations. 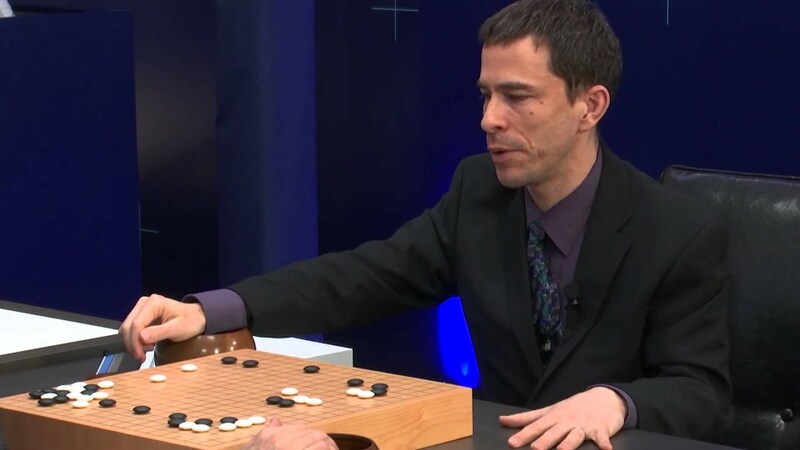 Lee Sedol made a comeback today after three consecutive losses, to beat AlphaGo in the fourth game. Playing as white, Lee won by resignation after 180 moves. 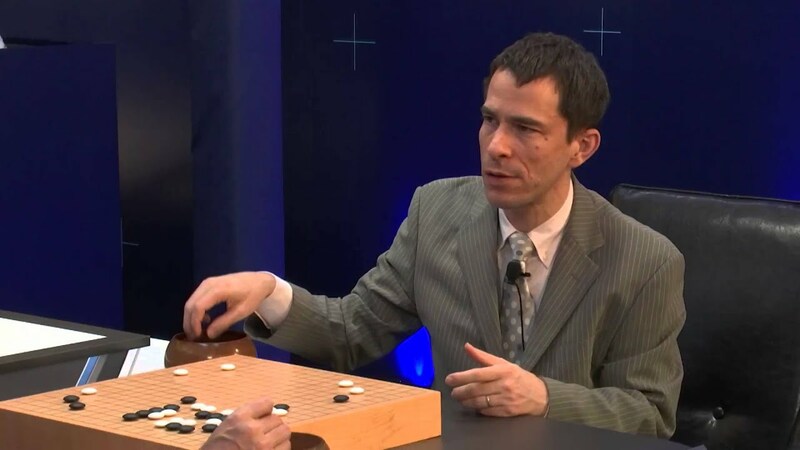 AlphaGo held a strong position for the first half of the game, but commentators noted that Lee Sedol played a brilliant move 78, followed by a mistake by AlphaGo at move 79. Like in previous matches, Lee used up all of his time and two periods of byō-yomi overtime. 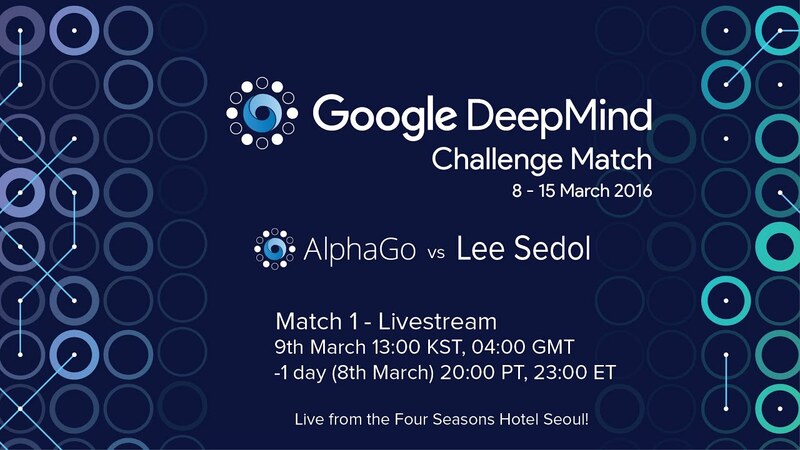 At the 3-1 match score, AlphaGo has already secured victory in the Google DeepMind Challenge Match, but today’s loss heightens the drama going into the final game, Game Five, which will be played on Tuesday, March 15 at 1pm KST. 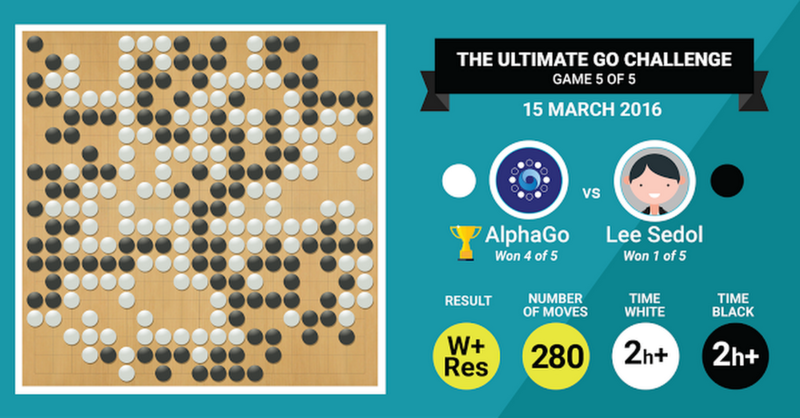 AlphaGo has just won its third straight game, claiming overall match victory against the best Go player of the last decade, Lee Sedol. 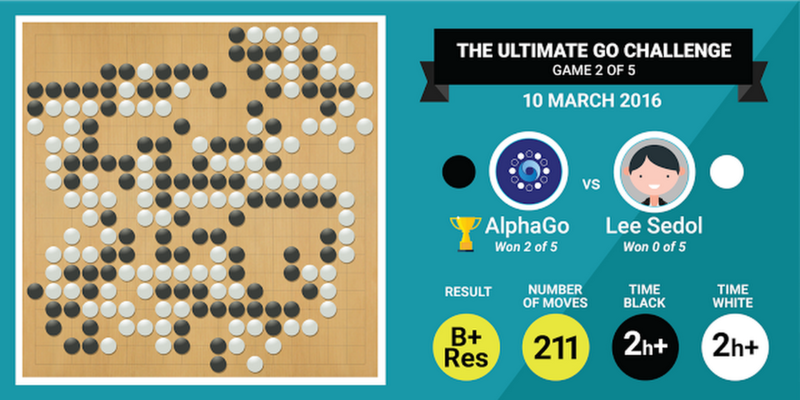 Playing as white, AlphaGo won by resignation after 176 moves. 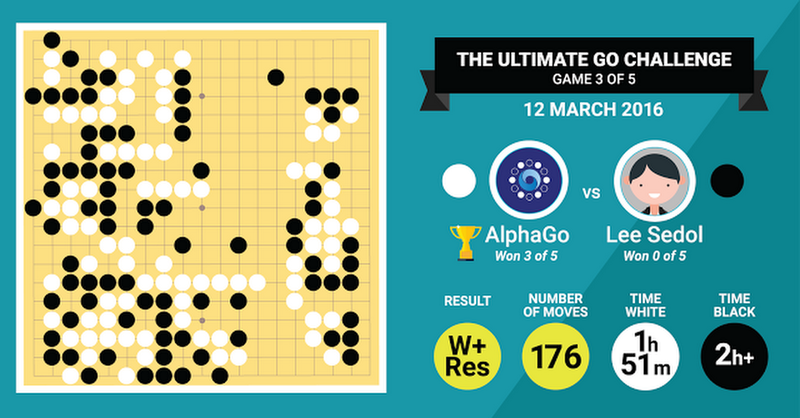 Lee used up all of his time and two periods of byō-yomi overtime, while AlphaGo had 8:31 left on the clock. All five games will be played to determine the final match score. The next game, Game Four, will be on Sunday, March 13, and the final game, Game Five, will be on Tuesday, March 15. 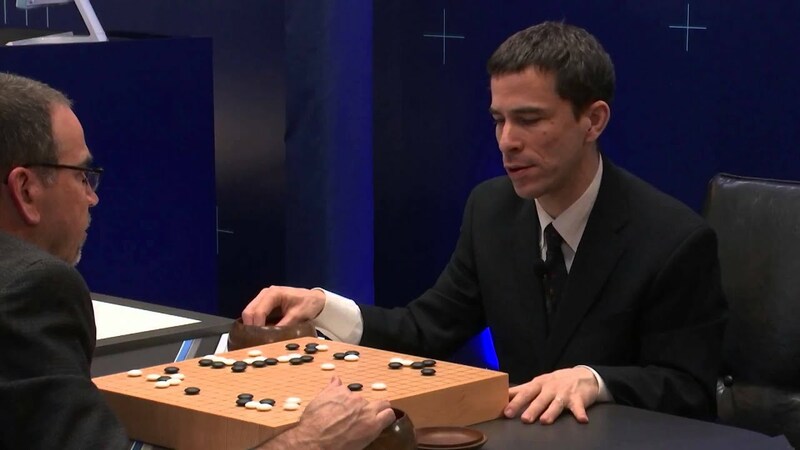 Both Lee Sedol and AlphaGo used their entire two-hours of time, going into byō-yomi overtime. 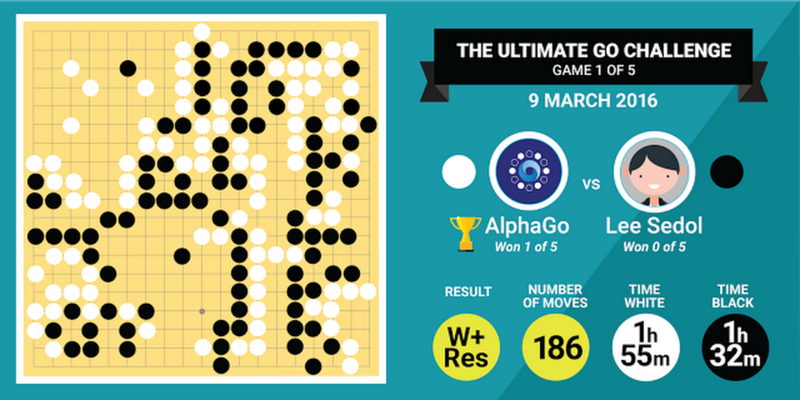 AlphaGo just needs one more win to claim victory in the five-game tournament. Either way, all five games will be played to determine the final match score. The ultimate challenge has finally arrived! 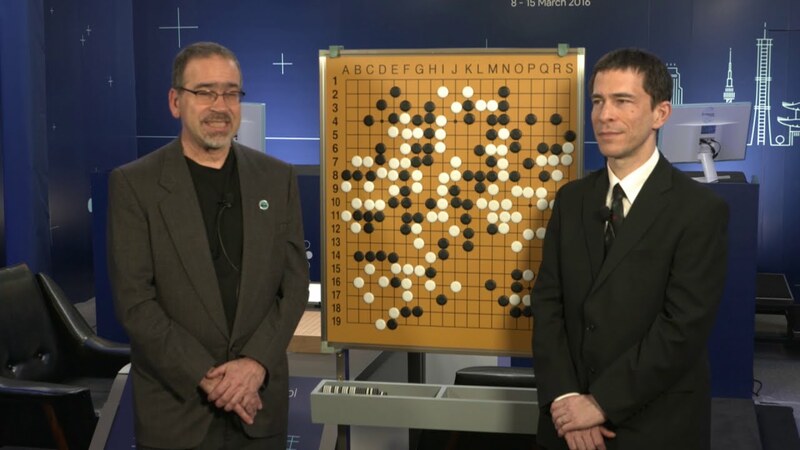 Starting tomorrow, AlphaGo, the first computer program to beat a professional Go player, will take on the legendary Lee Sedol—the top Go player of the past decade—in a five-game match in Seoul, Korea. 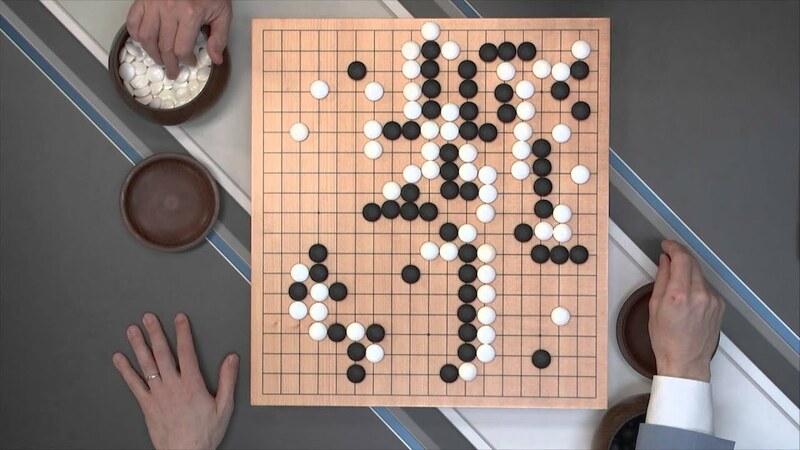 Go is a profoundly complex game, which is why this has always been regarded as the outstanding grand challenge for artificial intelligence. 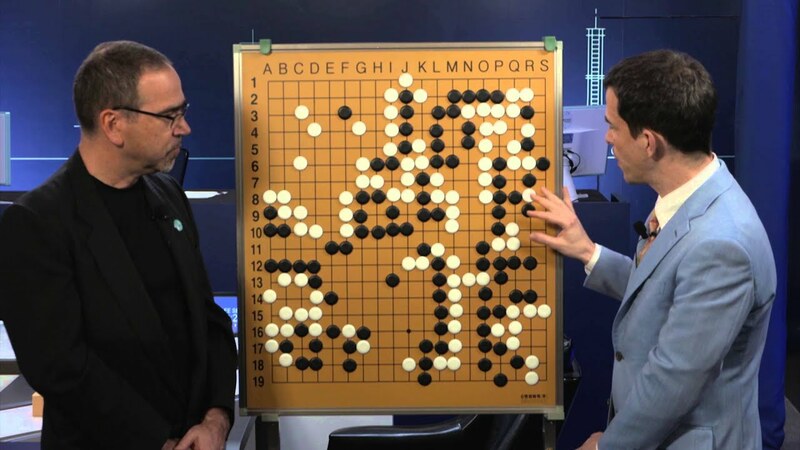 The matches will be played under Chinese rules with a komi of 7.5 (the compensation points the player who goes second receives at the end of the game). Each player will receive two hours per game with three lots of 60-second byoyomi (countdown periods after they have finished their allotted time). Each game is expected to take 4-5 hours. The games will be even (no handicap), with $1 million USD in prize money for the winner. 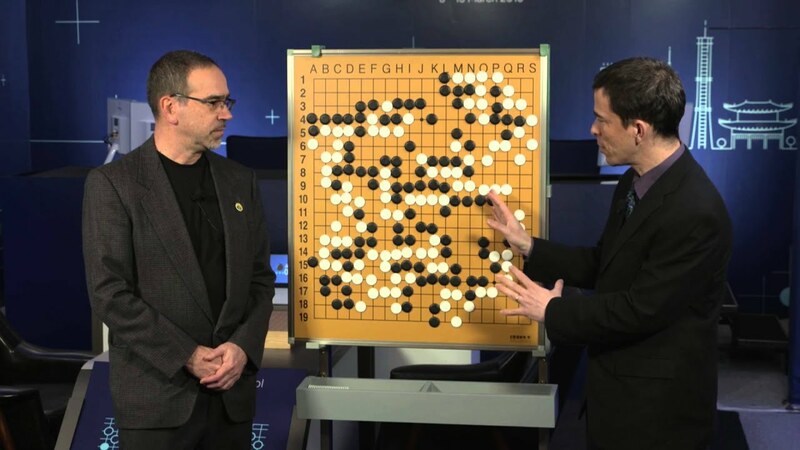 If AlphaGo wins, the prize money will be donated to UNICEF, STEM charities and Go organizations. As the match progresses, check back on this blog for the latest updates and results.